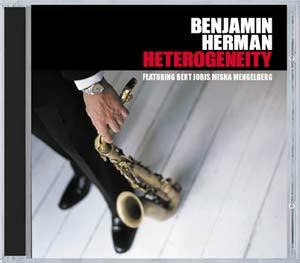 According to the dictionary Heterogeneity, the title of Benjamin Herman's most recent CD, means: the quality of being diverse and not comparable in any kind - a description that applies to both Benjamin himself and his music. Herman, who is always impeccably dressed - in 2003 he was nominated for the best dressed man in the Netherlands -, is an all-round musician: he is adventurous and versatile. He plays with his popular New Cool Collective Big Band as well as with, for example, the pianist Misha Mengelberg as on this record. In Allaboutcat he is accompanied by the famous Belgian trumpet player Bert Joris.